Regardless of which rooms or tours you choose, you are welcome with equal enthusiasm by our staff at the Amazon B&B The hotel is known for its excellent personalised service. No matter what happens, be it an unforeseen event such as a sudden rainfall or merely finding that you have a hole in your schedule, our staff is there to help you. Come where the Earth breathes! Our service concept is to provide our guests with a complete experience. For this reason, exclusively for them, we organise the best options of tours according to their needs and desires added to the knowledge that we have of this destination. We look for our visitors to feel comfortable and calm in front of the aspects of the planning and execution of the trip. Hence, for us, the experience of the Amazon begins from the moment they contact us, and so we want to make our guests’ dream come true. Our goal is to improve this service every day to offer them a quality experience. If you book with us , we pick you up at the airport for free. If you have purchased the accommodation package and tours the airport shuttle service for arrival and departure is included. If your booking is by other channels such as Booking or Expedia depends on the availability we have. If you have hired tours by other agencies, these usually offer you the airport transfer service, in that case, do not forget to request or confirm with your agency. Amazon B&B is a place to enjoy the delight of exotic cocktails, where the caipirinha is the king, and local fruits (with additional cost). The Amazon offers a wide variety of exotic fruits, rich in vitamins and with very particular flavours that need to be tested more than once to adapt the palate to these unusual flavours. Amazon B&B will offer you some of these juices because testing them can be a unique experience for you! Copoazu: It is a variant of the cocoa, it is white inside and has an exquisite flavour. Some indigenous communities use their seeds crushed to make chocolate. The juice can be a little acidic. Acerola or camu camu: It is rich in vitamin C, its juice is like a delicious pink lemonade that removes thirst in seconds. Carambolo: It is acidic, is very refreshing. In the international market is used in cocktails and is known as the star fruit. The best way to start the day is with one of the delicious breakfasts in our restaurant. Amazonian sunrise with flavours of the region. Vegan love only plant-derived proteins. Natural breakfast with the touch of yoghurt and cereals. Café da manhã a typical Brazilian breakfast. If you hire the tours with an outside agency, they usually know our schedules and can schedule a waiting time to pick you up or provide you with breakfast during the tour. 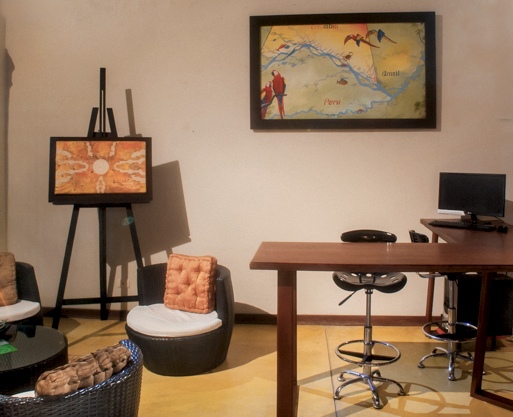 At Amazon B&B, we have different spaces that we adapt for the organisation of small meetings of work or social. So you can enjoy another type of service with the comfort and the friendly atmosphere that gives you our Hotel. For travellers who want to learn Spanish during their stay, the hotel will put them in touch with the Amazon Spanish College. If you are interested, you can make the reservation for private or group classes. 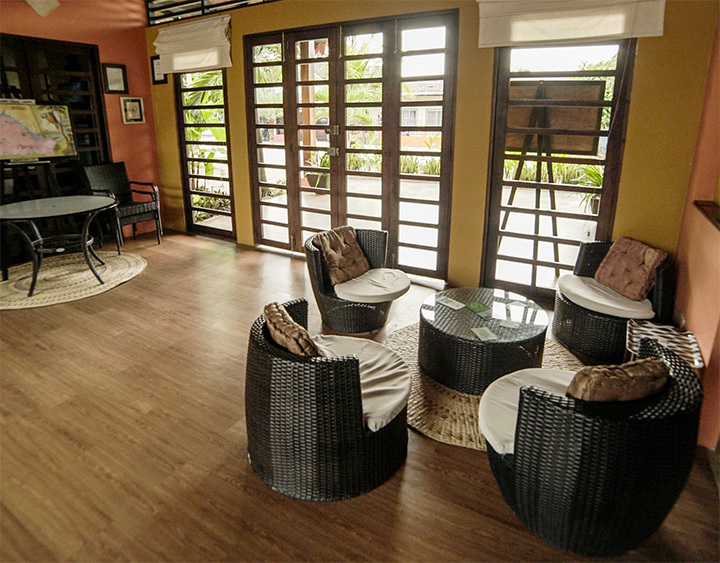 Our guests have access to a social area with a computer and internet, for you to keep in touch with family and friends. Whenever you feel like relaxing, the Jacuzzi is the place to regain your energy and keep enjoying the Amazon. Laundry service (With additional cost). Coffee and Juice Shop (With additional cost). Magazines, brochures and travel information material.